One of your '2 a week' fish portions ready in just 20 minutes. Preheat the oven to 200c, gas mark 6. Brush 4 large squares of baking parchment with some of the oil and place a salmon fillet in the middle of each one. Toss together the ginger, pak choi, carrots and mushrooms with the stir-fry sauce and the remaining oil. 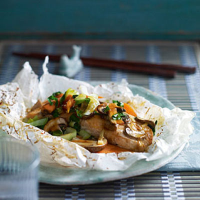 Arrange over the salmon and fold in the baking parchment to make loose parcels. Place on a baking sheet and bake for 12–15 minutes until the salmon is cooked through. Open the parcels and serve with steamed Jasmine rice. You can substitute 2 tbsp soy sauce and a chopped red chilli instead of the stir-fry sauce for an even simpler alternative.